- Place the seed in a damp Rockwool cube (2x2cm), which we separate from the others and turn for stability, upside down. A hole is then punched into the cube, up to half the height of the cube, into this hole the seed is placed. Rockwool cubes are then placed on the bottom of the growing container without a lid. Begin by placing the cube in water until the seed has germinated and after germination approx. the 4th day, we begin to fertilize to EC 0.5 according to the manufacturer instructions of the fertilizer. 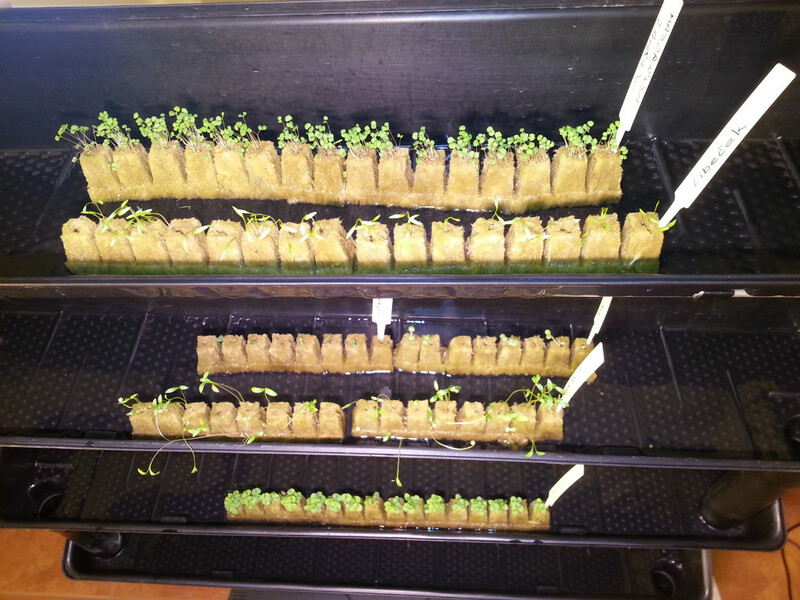 Once the seedlings have approx. +/- 10 cm, place the missing lids onto the growing pots and place the seedlings into the appropiate spaces provided. This is done according to the expected growth height of seedlings. Either at the assumed smaller growth of seedlings, we can use all the crop openings on the containers or with the expected increase in seedlings of approx. from 30 to 50 cm we plant in the "chessboard" pattern, which means every other hole in the horizontal and vertical rows. To tie up big plants, use Al sticks over the plant. - Make the cuttings with a clean cut from the "mother" plant at a 45 degree angle. On the stem in a length of 5cm to 7cm plus, minus, get rid of the leaves and all the sprouts. Cutings should be 10-12cm long. 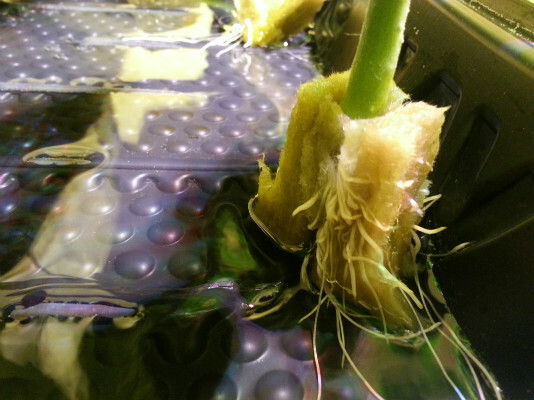 Soak them in the root stimulator and place them in Rockwool cubes 2x2cm, which we turn upside down for better stability. Punch the skewer in until it reaches the bottom and into the hole formed insert cutting. We place the cube on the bottom of the growing container without a lid where only water flows. Rooting lasts +/- 14 days. After that, we begin to fertilize to EC 0.5 and then start to increase it, according to fertilizer manufacturer's recommendation. 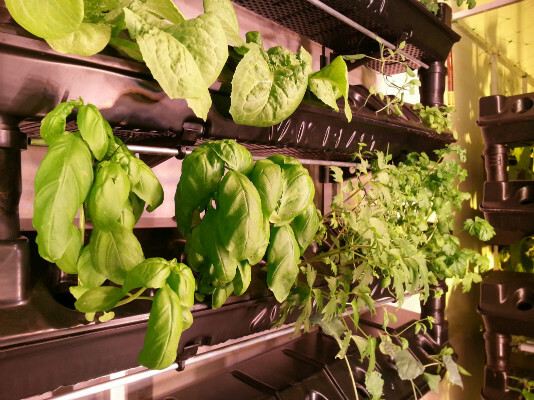 Herbs- Using a filter with clay, basil, oregano, thyme, rosemary, marjoram, chives, sage, cress, stevia, and plants which spread their roots such as: mint, lute ... can also be grown. Vegetables- peppers, shrubs, kohlrabi, various kinds of salads, and also peas, beans, cucumbers and others. The system can be used to germinate different types of seeds for food preparation. 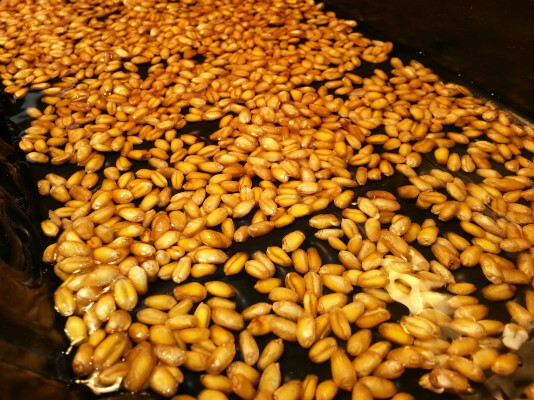 Seeds must be pre-soaked according to the germination table. After that, sow the seeds into the pots and spread them as far as possible. Insert and turn on the pump. The water must be constantly circulating after sprouting about 2-3 days, after which the seed can then be harvested for consumption. Chickpea 12 hod. 12 hod. Lens 8 hod. 12 hod. We place the system in a pre-disinfected space with sufficient surface area to accommodate the system, and permit the door to be opened. The direction in which the door opens is your choice, left or right. The system can be placed in a so-called growing tent. Depending on the area, it is necessary to ensure proper ventilation of the entire area. This means ensuring sufficient air intake, exhaust and, if necessary, ensuring the air flow around the room by ventilator, to compensate for the temperature and humidity of the air throughout the room. Our systems are conceived to be as simple as possible for service and maintenance. Everything is simply taken apart, cleaned and used again. Growing is very simple. Everything is always accessible, throughout cultivation (root system, the inflow of living solution). MINIMIZATION OF WASTE (no solid media, only unused plant parts and their root system, you do not waste time or money in cleaning, disposing and then buying different types of media - rockwool, clay, coconut, loam). The disadvantage of this system is that it is not possible to interrupt the delivery of the nutrient solution for a longer period (depending on the density of the roots, the more roots the longer it is able to retain moisture, It also depends on whether the light is on, it shortens the survival time). Also for a period shorter than approx. 10 seconds when the electricity supply is interrupted. The energy of the water in circulation begins to fall by gravity to the ground, and for a few seconds, the pump is aerated. We recommend equipping the growing system pump with an external backup power source such as a computer (PC).